For this Green Tara practice weekend, people are welcome to join in at the beginning of the breaks or stay for the full weekend. Instruction will be given in each session. 10:00am–12:00pm – Open preliminary practices and meditation. 1:00–2:30pm– Meditation and Green Tara Puja (Practice). 3:00–5:00pm – Mediation and Green Tara Puja (Practice). 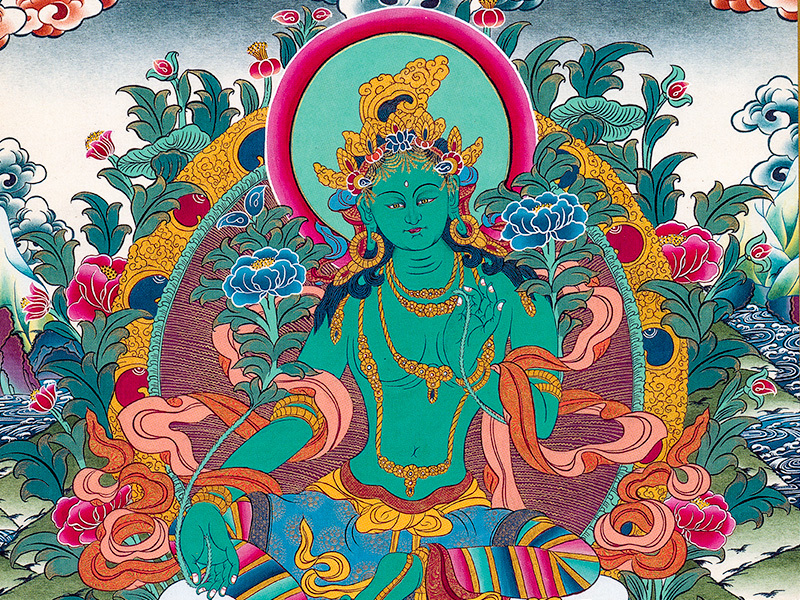 1:00-2:30pm – Meditation and Green Tara Puja (Practice). 2:30-3:00pm – Refreshment Break (Tea, Coffee and Light Snacks will be provided). 3:00-5:00pm – Green Tara Puja (Practice) and concluding meditations. Overnight Accommodation: Rooms in the retreat house are free of charge to sponsors, but require advance confirmation by RSVP since space is limited. For non-sponsors, rooms are available at $30 (+HST) per night. Please contact us in advance to reserve a room to avoid disappointment. There’s also a number of local accommodations available in the vicinity.